Rev. and Mrs. Otho Winger are here from Bloomington on a visit with her parents, Amos B. Miller and wife. Mr. Winger was formerly a college student here but is now completing his course at the state university. A more tangible expression of North Manchester's appreciation of President Otho Winger's many years of service as a leading citizen was made Friday in the presentation to him of a new, marooned colored DeSoto automobile. It came as a complete surprise to Pres. Winger and he was quite overcome. The presentation was made at the conclusion of the Senior Recognition Day Program Friday morning. President Winger was guided to the front steps of the administration building where a crowd was gathering with Coach Carl Burt as master of ceremonies. Dean Carl Holl paid tribute to the president for his service to the college, and City Attorney Raymond Brooks expressed an appreciation for the townspeople. then as E.W. 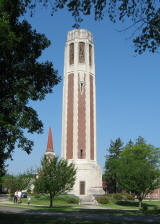 hearn drove the automobile which had been concealed near the boys' dorm, out on the walk in front of the steps, Robert Stauffer presented Winger with the set of car keys. The thought of the presentation came when it was discovered that Pres. Winger was bargaining for an old second-hand Ford. A committee was quickly organized with Carl Burt as chairman, consisting of E.W. Hearn, Robert Stauffer, Ad Urschel and Clay Syler, to raise funds to purchase a new car. A canvass of citizens, members of the faculty and business men readily produced the necessary funds for a new DeSoto, equipped with a heater, and full coverage insurance for a year. In the midst of the expansion, which included increasing enrollments, war came and attendance declined as men entered the war. And a very different crisis faced the College.. The flu came to campus. School was closed for four weeks.. Most of the students stayed on campus since the situation in their home areas was no better. At its worst there were 65 cases on campus and few well enough to care for them. President Winger spent most of his time trying to do what was possible for the men. Two of the students were faithful help for the women. Four students died: three at their homes and one on campus. After the experience with the flu, there are increased concern about medical care on campus. Donors gave money to buy a house close to the campus to be used as a hospital. Then a full-time physician was employed with an office in the hospital. Many students were treated there. When the hospital was closed the building was used in the Home Economics department as a home management house and in the early '70s it became Aafro house before it was sold to a private owner. So it came to Manchester. Meantime, more land was purchased, little by little as it became available until the campus reached the Eel River and included the college woods. A more formal recognition of the College required a significant increase in the endowment. In June of 1919, the minimum was reached and the State declared Manchester a standard college. But the North Central Association raised the requirement to five hundred thousand dollars. After a major effort that goal was reached in 1924. The next goal was to obtain membership in the North Central Association. The administration asked for a survey in 1931 and were very uneasy about the results. President Winger reported that "It was one of the happiest moments of my thirty years when it was announced at the meeting (of the North Central Association) that Manchester had been admitted to the Association." 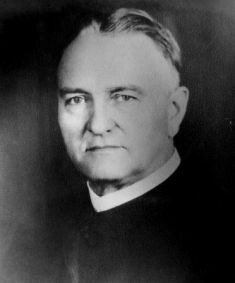 Otho Winger died August 13, 1946 and his funeral sermon was given by Dr. Vernon Schwalm.